"A New Yorker in Shanghai". When ambitious New York attorney Sam is sent to Shanghai on assignment, he immediately stumbles into a legal mess that could end his career. 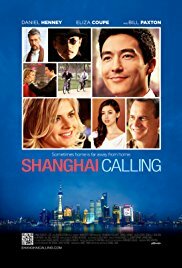 With the help of a beautiful relocation specialist, a well-connected old-timer, a clever journalist, and a street-smart legal assistant, Sam might just save his job, find romance, and learn to appreciate the beauty and wonders of Shanghai. Written by Anonymous (IMDB.com).